Eaton Heights is a largely suburban neighborhood located in eastern Manchester. This neighborhood is bordered by Wellington Road and Route 101-East to the north and northeast, Interstate 93-North to the east, Laydon Street to the south, and Route 28A to the west. Eaton Heights developed along a prewar streetcar line that ran along Hanover Street. While horse-drawn carriages served as the main form of transportation in early suburbs, cable cars and electric streetcars (trams) became popular in the late 19th Century as people built homes farther from the Center City. The development of Eaton Heights was strongly influenced by the streetcar lines running through this neighborhood. For this reason, Eaton Heights was considered a streetcar suburb. 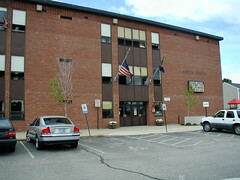 Today, Eaton Heights is home to Derryfield Country Club and Stevens Pond. Stevens Pond has been a popular recreation spot with Manchester’s young and old for generations. Today, the pond is heavily used by area residents for fishing and skating. How healthy is your neighborhood? With the ongoing opioid crisis, the potential for dramatic increases in morbidity of viral hepatitis, human immunodeficiency virus (HIV), and other infectious diseases among New Hampshire (NH) residents is a very real threat...NH is also experiencing an increase in sexually transmitted diseases (STDs). Established in 1932, the Derryfield Country Club includes a 115.5 acre, eighteen-hole regulation public golf course located in the heart of the Queen City. Manchester ConnectsConnecting businesses and residents to events, programs and activities. The Manchester Connects planning initiative is working to connect businesses and residents to the events, programs and vibrant activities around the city to the Downtown and Millyard areas—and to the Merrimack River. Watch Groups and police work together to prevent and fight crime, also to improve the quality of life in the City’s neighborhoods. The link will display how many, if any, Neighborhood Watch Groups are in your neighborhood. The contact information has been provided if you would like to join a current group or start a new group in your area. Visit this guide to learn how to identify health needs in your neighborhood and to work with others to create solutions. Manchester CrimeLine, Inc. is a nonprofit organization that works alongside the Manchester Police Department, offering rewards to citizens who provide information that leads to the arrest and indictment of criminals. Formed in 1981, CrimeLine has assisted the MPD in solving thousands of cases, making Manchester a safer place to live, work, and raise families. The Greater Manchester Chamber of Commerce (GMCC) is the largest chamber in New Hampshire, representing nearly 1,000 businesses. Incorporated in 1911, the GMCC focuses its efforts in the ten communities of Auburn, Bedford, Candia, Derry, Goffstown, Hooksett, Litchfield, Londonderry, Manchester and Merrimack. The Manchester Young Professionals Network (MYPN) aims to create business and social opportunities, support professional development and welcome new and existing young professionals to the Manchester, NH community. MYPN was New Hampshire’s first young professionals’ networking organization, established in 2004. Report a pothole that needs repair, communicate with your elected official, reserve a book at the Manchester City Library or a tee time at Derryfield Country Club. This app has it all. You can use this free tool as a private social network for your neighborhood. It is an easy way to share information on upcoming events, as well as inquiries about local services. Do you have a loved one with special medical or mental health needs that you need to alert first responders about? Use the link to complete and return an alert form to the NH Department of Safety so they can be prepared. Register for Alerts and Community MessagesSignup and select your town/city as your community. Sign Up for City Newletters/Alert NotificationsGet current news and events the easy way! Adopt-A-Site encourages local businesses, landscaping professionals and volunteers to assist with the beautification of City land. The opportunities for adoption range from volunteering at your neighborhood park to developing a landscape traffic median. Donate to CharityUse the Advanced Search to find charities in Manchester, NH or towns within the region. Medical Reserve Corps units are community-based and function as a way to organize and utilize volunteers who want to donate their time and expertise to prepare for and respond to emergencies and promote healthy living throughout the year. Medical Reserve Corps volunteers supplement existing emergency and public health resources. A volunteer organization sponsored by the American Radio Relay League (ARRL®) providing specific communications capabilities in times of emergency. All ARES volunteers are FCC licensed Amateur Radio operators who have registered their abilities and equipment, and have been trained to serve as emergency communicators. Learn Where You Can Volunteer. Make a Difference. CSA Pick-up Sites (June-October): Kalivas Park (corner of Lake Ave., Chestnut & Spruce streets)- Tuesday 2:30-5:30pm; Lafayette Park Wednesday 3-6pm; Elmwood Gardens- Monday 12-2:30pm; Dartmouth-Hitchcock Friday 4-6pm Farm Stands (June-October) : Kalivas Park (corner of Lake Ave., Chestnut & Spruce streets)- Tuesday 2:30-5:30pm; Lafayette Park Wednesday 3-6pm; Elmwood Gardens Monday 12-2:30pm. The Manchester Community Market is a unique and exciting community event held every Thursday, from June through October from 3-6:30 pm. 105 Concord Street Next to Victory Park Across the street from the Manchester Public Library. Free Bus Service From the Market! The Granite State Market Match Program: earn up to $10.00 in FREE fruits/veggies when using your SNAP/EBT Benefits Card. Bike rentals are available in DOWNTOWN and NORTH END neighborhoods. Manchester Bike Share memberships available. There are several fire roads on Manchester Water Works' land that are accessible to the public for hiking and biking use. FREE HELP with quitting smoking and chew tobacco is available for anyone in NH. 211 New Hampshire Get Connected. Get Answers.